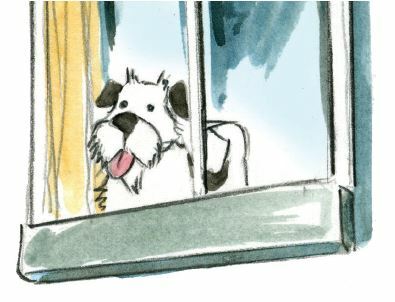 Welcome to my spanky new website. Well, it’s not entirely new. But I’ve swept the cobwebs out of the corners and given the walls a fresh coat of paint. What’s nifty about this design is that it works well on all devices – from jumbo computer screens to smart phones. What sold me on it was the cool way it shrinks and grows images according to window size. The second story has come back from Marg, my editor, and I’ve been polishing it up over the past week or so. It’s called The Boy Smith and the Giant of the North. It’s the story of a boy who faces four impossible tasks in order to become sole suitor to a princess. The cover’s done and it will be out August 7th, 2014. The third tale will go off to Marg in a week or so. It’s done, but I want to give it a once over before it leaves my hands. I’m happy to report that work on my fairy tales is going extremely well. 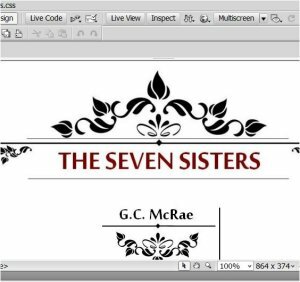 Above is a little snippet of the title page for the first one. The text has been off to Marg, my editor and is now back and fully polished. The covers for all seven tales are pretty much done. If it’s possible to love the first two any more I already do, it’d be a miracle. I’m still working on The Boy Smith. Every day makes it better and better and as of this morning, I only have a wee bit of tweaking to do. Joy of joys, this afternoon I sent The Seven Sisters off to be recorded for an audiobook. Stay tuned on that one. It’s going to be crazy good. 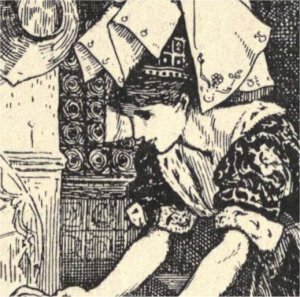 I am now going great guns on preparing my fairy tales for publication. The plan is to polish the heck out them, get them off to my editor and release individual ebooks of the stories for Kindle. The first out will be The Seven Sisters, and I’ve just finished a wonderful buff & shine of it. I also have a really inspired concept for the cover of each and work on those has already begun, so stay tuned. Once all seven are out, I’ll release them in print as The Seven Tales. I’m currently working on polishing The Boy Smith and the Giant of the North. I tell ya, it’s so satisfying knowing these will be out in the world soon, being read as bedtime stories to kids and adults alike. If I could do nothing but fairy tales till I drop dead of old age, I’d be very happy. Last week it was -44°C with the wind chill. This week it’s +10°C. Virtually overnight, I went from hiding inside and worrying about the animals to wanting to spend all my time out in the yard. 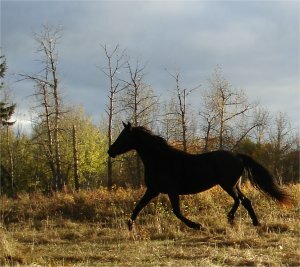 Yesterday, it was all about my big horse, Piper. Brushing, combing, teaching her to let me do some rudimentary farrier work on her hooves. Now I’ve got the smell of horse in my nostrils and I can’t stand to be inside! I have put all my usual fiction writing on hold for the last couple of months to write something wonderful, outrageous and ridiculously funny. I’m 2/3 of the way through and progress is so steady, I should be done within the month. I love having a secret project. Check out it out in HD on YouTube! Well, my lovely little website was down for a few days. I think the guys who hosted my web stuff must have robbed a bank and flown the country. Even their own site is still down and they are incommunicado. I wish them well and hope they don’t choke on their mai tais (much). So I have a new host and I’m very happy with them. It means taking some time and getting everything back up to speed. But as you can see, it’s going pretty well. On the book front, Dianna is working hard on Kana and the Red Pilot. She’s done the interior and is working on the front and back covers right now. I’ve set the release date to be in March, 2014. But I’ll likely have pre-release copies long before that. I’ve been reading bits of the book to kids in schools in Edmonton and if I can’t get a copies into their hands in the next month, they will not be very happy (to say the least). On the biz front, I have an awesome new logo for my publishing company, MacDonald Warne Media. It’s was designed by the extremely talented Cheryl McCartney. Both Kana and the Seven Tales will be under the MWM banner. We had our first big dump of snow yesterday so all our critters are feeling it. The chickens are glad to be inside. The calves have a new shed and a deep heap of bedding to snuggle into. The turkeys are still wandering around looking for their pants. (There’s nothing you can do about that.) And I’m building the most awesome shelter for the horses. Things are progressing on the writing front quite well, thank you very much. I just finished writing a story that has taken me since August to get on paper. It’s called The Sneaking Girl and the Other Queen. (Yeah, I know, weird title.) 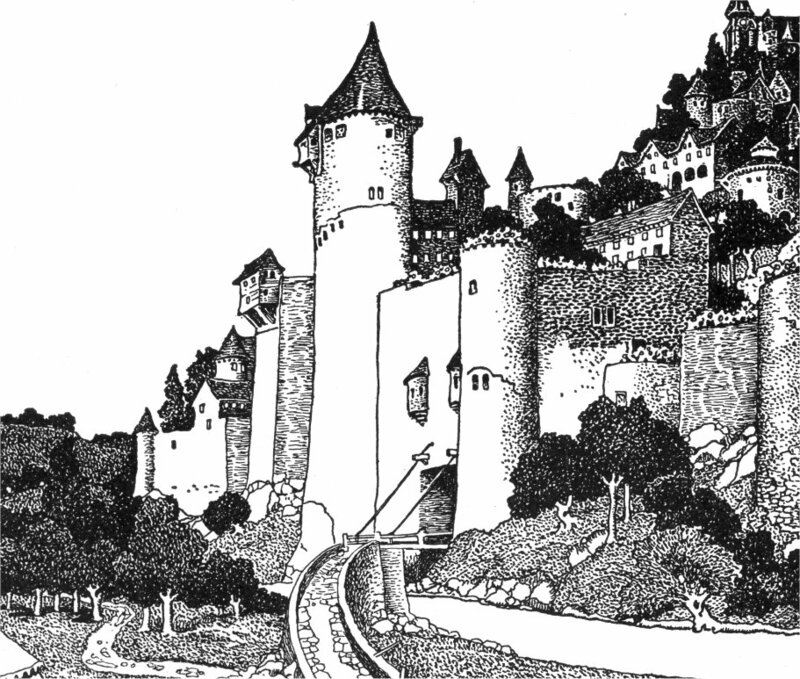 After completing Seven Tales, it was a bit of a challenge to see if I still had the chops write another book of fairy tales. Confidence is everything in this game. And I’m happy to report that this is one of the best tales I’ve ever written. So, onward from here. Pretty Ballerina went to the printer last week and I expect a proof in the next day or so. And Dianna Little, my extraordinary designer, has already started work on Kana and the Red Pilot. I’m still on a bit of a high after finishing that new fairy tale, so I’m not even thinking about my next project. OK, that’s not entirely true. I’m just taking a snow day to laze on my laurels. The picture kind of speaks for itself. This is seriously one of the coolest literary events I’ve ever been to. Kids, parents, books, cookies and milk. What more do you need? I had a wonderful time reading to everyone. 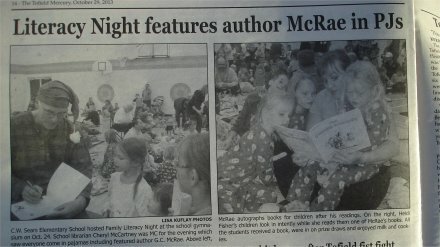 Many thanks to C.W.Sears School and especially to librarian, Cheryl McCartney for inviting me to this wonderful event! 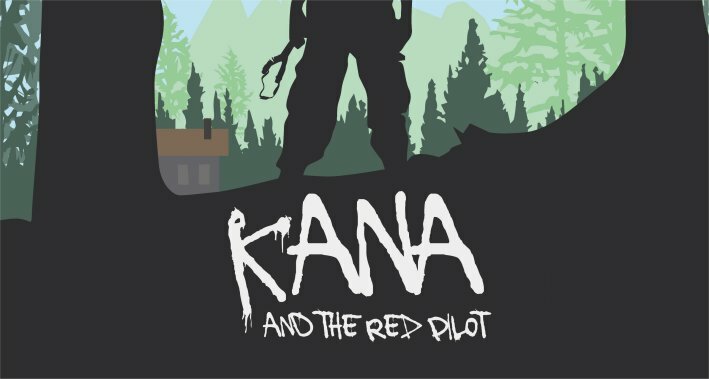 Kana and the Red Pilot… Out Now! Kana is now out in the world! Big thanks to my wonderful editor, Marg Gilks; to the fabulous artist, Mads Hindhede, who designed and drew the cover; and Dianna Little who (despite all the wrenches I threw into the works, did an extraordinary job on the design and layout of the book. Here’s a link to Kana on Amazon.com. Pretty Ballerina is finally published! Among other places, check it out here.